Do You Need More Vitamin B12? Help your nerves produce the insulator, myelin. The myelin sheath prevents us from developing neurological problems like, neuropathy, loss of balance, hearing problems (tinnitus), and depression. Necessary ingredient in the production of red blood cells. Without B12, your red blood cells don’t mature and subsequently have a hard time carrying oxygen. This contributes to anemia, fatigue, and shortness of breath. Necessary for your body’s ability to perform the methylation cycle. This cycle is central to detoxification, hormone production, and healing. Necessary for supporting the function of the liver. Without B12, your liver can become fatty, a disease sometimes referred to as NAFL (non alcoholic fatty liver disease). The diagram below illustrates some of the major functions of this critical nutrients. 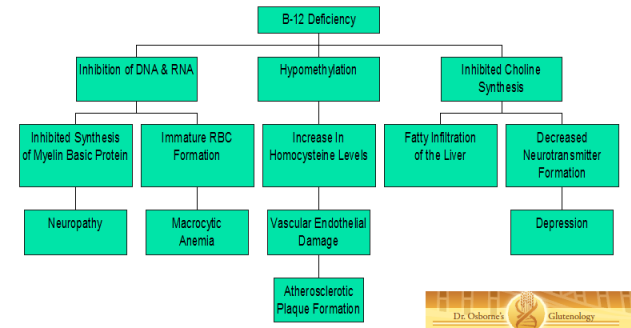 Follow the diagram all the way down to see which diseases are linked to vitamin B12 deficiency.